We use many of the softwares that installed in our system. Some of they are free softwares or paid softwares. Paid softwares should be installed with a serial numbers/license keys that verify a single user system to use. Generally our windows operating system also has serial number for unique systems. Softwares like photoshop, Microsoft office, Nero also need license numbers to use. If you purchased the paid softwares and installed in your system, you must note the serial keys for the further long-term usages. The operating system may be crashed by viruses and other several problems. At that time you have to format your system and reinstall your operating system and then all softwares again.If you have all license keys of softwares, you can simply enter it and re-activate all applications. Most of us do not note that keys so we will get head-ache and to find the CD's of paid softwares. You have not written license keys yet and you may think how to retrieve the keys from your system. 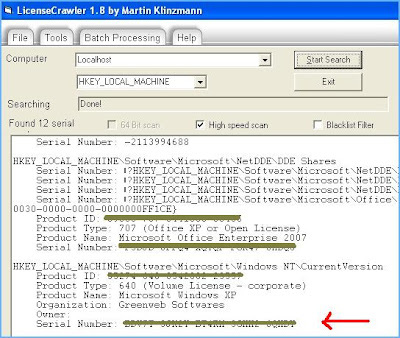 There is a freeware named "License crawler" is a simple tool to retrieve the serials of installed softwares in your system. This software scans through windows registry and lists all serials of registered softwares. You will get your own keys of windows Os, Ms-Office, Winamp, Nero and all of your applications. 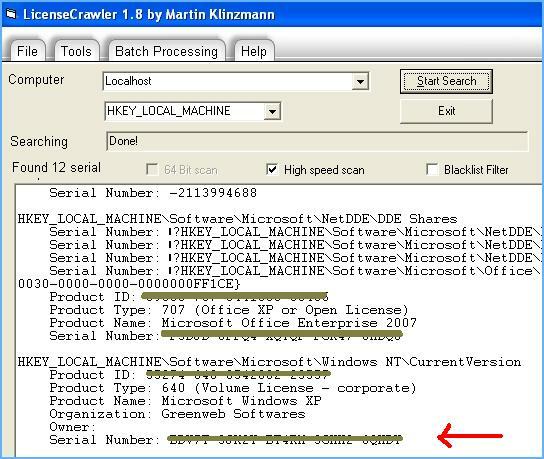 License Crawler can run within a portable devices. After downloading this software, select your computer name and which registry part to be scanned. Set this as "HKEY_LOCAL_MACHINE" to find license keys. You can save all license keys in a text file on your local drive or write down on the paper. That's all.